(Santa Fe, NM) – Kathleen Moeller-Peiffer has been appointed by Secretary of Cultural Affairs Veronica Gonzales to lead the New Mexico State Library. Ms. Moeller-Peiffer will commence her duties as State Library Director beginning in early June. The Governor-approved appointment is the result of a national search conducted by an appointed search committee. The Committee recommended top finalists to Secretary Gonzales and Governor Susana Martinez for their consideration. Ms. Moeller-Peiffer brings 37 years of experience in Library and Information Science, most recently serving as New Jersey’s Deputy State Librarian for Lifelong Learning. She has spent the past 11 years at the New Jersey State Library in programming, management, administration, and budgeting for 300 public libraries. Ms. Moeller-Peiffer oversees the federal Library Services and Technology Act (LSTA) grant and serves generally as grants manager for New Jersey’s State Library. In this capacity she oversees a substantial budget, which includes the administration of a $4 million LSTA allocation. Ms. Moeller-Peiffer has served within the New Jersey State Library system as a supervisor of project specialists, working in the areas of small business outreach, technology, youth and older adult services, e-government, diversity, literacy, rural and urban libraries. In addition, she has written several successful grant and award nominations on behalf of the State Library and the Talking Book and Braille Center. Secretary Gonzales also acknowledged the hard work and dedication of Deputy Cabinet Secretary Michael Delello, who has served as the interim Director of the State Library Division for the past year. Deputy Delello raised the importance of rural services, and especially the Bookmobile program. He also conducted extensive statewide outreach to the public libraries and worked closely with the New Mexico Library Association. “I am eager to assume the role of director of the New Mexico State Library,” Moeller-Peiffer said. “I understand the complexity of a State Library administrative agency and look forward to making the very best library services available to the residents of New Mexico. My hope for the immediate future is to meet with library associations, organizations, and individual library leaders throughout New Mexico to understand both the successes and challenges of delivering library service in our state. I also want the New Mexico State Library to be in a leadership role for public libraries in terms of ‘best practices’ in library and information services,” Moeller-Peiffer said. Ms. Moeller-Peiffer has a Master’s Degree in Library and Information Science from Florida State University and a Bachelor of Arts degree from the University of South Carolina. 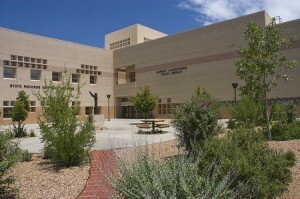 The Department of Cultural Affairs is New Mexico’s cultural steward and is charged with preserving and showcasing the state’s cultural riches. With its eight museums, eight historic sites, arts, archaeology, historic preservation and library programs, the Department is one of the largest and most diverse state cultural agencies in the nation. Together, its facilities, programs, and services support a $5.6 billion cultural industry in New Mexico.